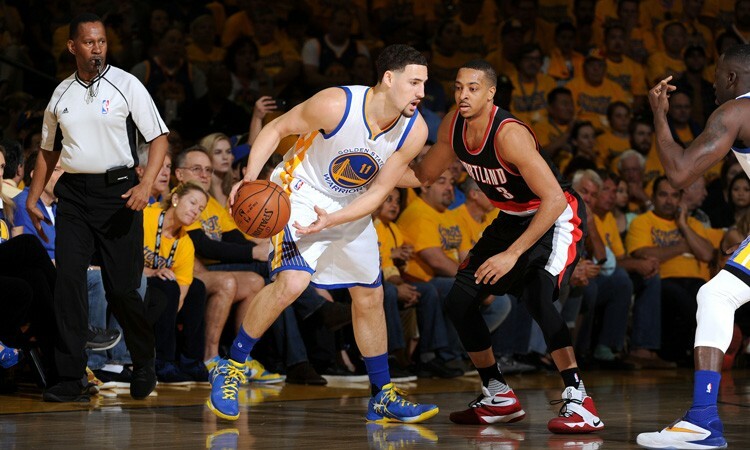 OAKLAND, California - The Portland Trail Blazers have absolutely no chance of knocking off the Golden State Warriors in the 2nd Round of these NBA Playoffs. None. Zero. Stop daydreaming. It is not going to happen. In fact, the best that the Blazers can hope for at this point would be to take one single game in the series. That's it. And after watching Game 1 between the Blazers and the Curry-less Dubs, in which the Golden State defense suffocated the Portland backcourt tandem of Damian Lillard and CJ McCollum, do you not agree? In fact, but for the injuries to Clippers' stars Chris Paul and Blake Griffin last series, the Trail Blazers would be golfing right now. But Paul and Griffin did go down, and that bolstered the Blazers' confidence and carried them to four straight wins over the Clips after trailing 0-2 in the series. 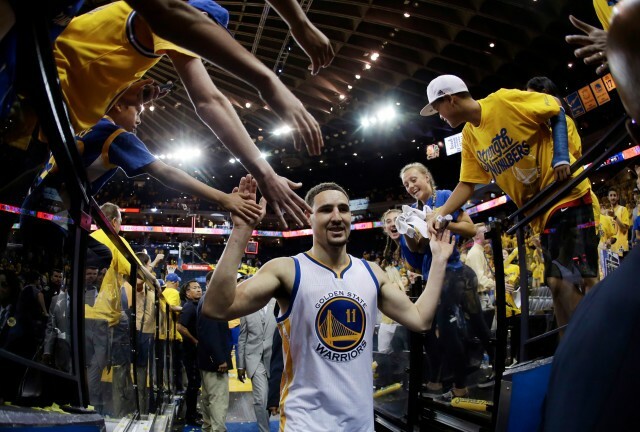 The Golden State Warriors, however, are not the Clippers. Even with the best player on the planet shelved for most, if not all, of the series, the Warriors may still be the best basketball team in the world. Was that not apparent while watching Game 1 yesterday afternoon? For as good as the Warriors are offensively - with their small ball system, their precise shooting ability, and their team-first ball movement - they are even better on the defensive end of the floor. On the season, the Dubs ranked 1st in the NBA in FG% against, holding their opponents to just 43.5% from the field. They also ranked 5th in 3FG% against, with their opponents only able to knock down 33.2% of their three point attempts. Despite those off-the-chart numbers, the Warriors were even better yesterday, holding the Trail Blazers to 39-97 (40.2%) from the field, and 10-31 (32.3%) from three. More importantly, the Warriors held the Blazers' backcourt duo of Lillard and McCollum to just 13-43 (30.2%) from the field. And although Lillard ended the game with 30 points, 5 assists and 4 steals, those numbers were inflated after the game was well decided, as the Blazers were never able to get closer than 12 down in the 2nd Half. The point of today's rant is not to bash the Portland Trail Blazers, however. I love Damian Lillard, and think he is well worth the price of admission. One of the best all around PG's in the league. I also love CJ McCollum. How can you not love a guy from Lehigh? No, today's point is just to emphasize how well balanced the Warriors are and how much of a mismatch this 2nd Round series remains, even if Curry sits out the entire way. Klay Thompson and Draymond Green are stars in the NBA. Thompson would be a 25-28 ppg player were he not lining up alongside Stephen Curry every night, and Draymond Green is one of the top overall talents in the league, capable of both dropping 30 and holding the opponent's top player to single digits at the same time. He can also rebound like a center and set the table like a point guard. Combine those two talents with top quality glue guys like Harrison Barnes, Andre Iguodala and Shaun Livingston, and you get a composed, well balanced team capable of winning every game it plays. Which brings me to my next, and last, point: we should not see Stephen Curry on a basketball court until the Western Conference Finals. He's not needed until then. His teammates are more than capable of ending Portland's season in 4-5 games. Why risk re-aggravating a knee sprain? To win games by 30 instead of 20? I understand the argument that you do not want Curry "rusty" heading into a series with, most likely, the San Antonio Spurs, with the West title on the line. But Curry is up and shooting at the present time with no pain in his knee. Practice and simulated game action can keep his accuracy sharp and his timing crisp. It can also ensure that there is no sweat residue on the court while he's trying to defend. Inserting Curry into a game that he is not needed would be, in my opinion, the equivalent of coaching malpractice. The last thing the Golden State Warriors want, along with the entire sports watching world, would be for Stephen Curry, in a Game 4 blowout of the Trail Blazers, to tweak some other part of his body or, worse yet, his already injured knee or ankle. Nobody wants a Western Conference Finals without Stephen Curry. We can all live, however, with a mismatched series against the Blazers with the MVP in street clothes.